My Name is Eileen: Update: The Brown Sugar Caramel Fro-Yo and Lace Cookies Won! Update: The Brown Sugar Caramel Fro-Yo and Lace Cookies Won! I won the first NoshGirl Chef Challenge! All I have to say is yahoo! And a big thanks to Serena for hosting the competition. 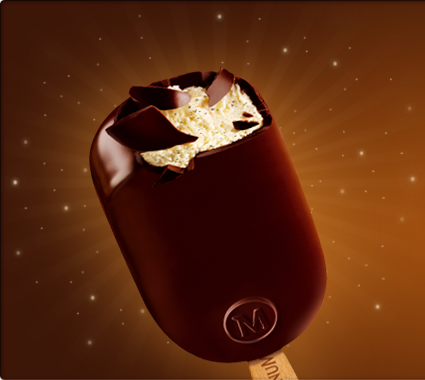 In other news, Magnum Bars finally made it to the United States last month. If any of you have ventured over to Europe, you've probably sampled these amazing ice cream bars. They're so good, and I was overcome with excitement when I saw them in the grocery store the other day. So overcome in fact, that I bought some. And I was glad that I did. Congratulations on winning!! Keep baking the good stuff. Congrats Eileen! You definitely deserve it and Im dying to try your recipe (perhaps when the weather warms up a bit here). And you guys didn't have Magnums in the states? I eat those all through summer!